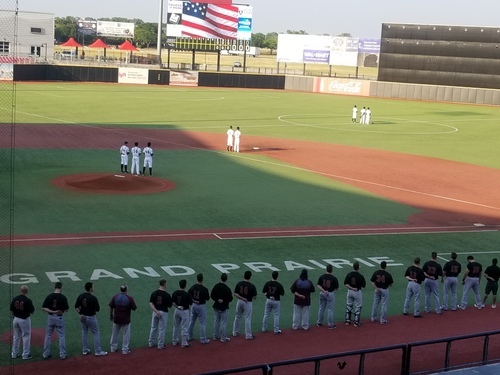 KANSAS CITY, Kan. – The Kansas City T-Bones came up short in Grand Prairie, falling to the Texas AirHogs , 3-2 powered by the Beijing Shougang Eagles. Key defensive errors proved costly for Kansas City despite another impressive pitching performance from the starting rotation. In the first inning, doubles by Stewart Ijames and Dillon Thomas gave the AirHogs an early 1-0. lead. Thomas hit his second double of the game in the fourth inning. A wild pitch by Adkins sent Thomas to third base, setting up a sacrifice fly to right field by Ryan Wagner. Thomas scored, extending the Texas lead, 2-0. Kansas City started their comeback in the top of the fourth with back-to-back singles by Tucker Pennell and Angel Rosa. Dylan Tice walked to load the bases for Todd Cunningham. Cunningham also walked, scoring Pennell to cut the Texas lead, 2-1. In the bottom of the fifth, a crucial overthrow by Zach Walters allowed Chu Fujia to reach second. The next at bat, Ijames hit a single, scoring Fujia for a decisive unearned run. The AirHogs went on to win, 3-2. After an RBI double by Cunningham in the seventh, the T-Bones were in position for a late inning comeback. Kansas City failed to complete the comeback after stranding Walters on third with one out in the eighth inning. Hunter Adkins (1-2) pitched five solid innings for Kansas City, allowing eight hits, and two earned runs. Meng Weiqiang (1-2) was rewarded with the win for the AirHogs holding Kansas City to one run in five innings. The T-Bones fell to 9-8, staying in fourth place in the South Division. The AirHogs picked up a much-needed win. They are currently in last place in the South Division with a 3-14 record. The T-Bones and AirHogs will play game two of their three-game series Wednesday night at AirHog Stadium in Grand Prairie, Texas. Game time is 7:05pm and can be heard on the T-Bones Broadcast Network. The T-Bones return home on Monday June 11th to open a four-game series with the Sioux City Explorers at 7:05pm. Media Relations Department at (817) 739-3693. Stay tuned to www.tbonesbaseball.com. and the T-Bones Facebook and Twitter pages for updates throughout the season.